We get it, you’ve just started the wedding planning process and you are so excited, so are we! You’ve set the date, found an amazing venue, and you’re excited to start picking flowers, photographers, cake and all the fun stuff. But there is one important thing you need to do first! Create and send your Save the Date! You will spend months planning the perfect event for you and your fiance, so make sure you let your guests far in advance so they can be there to celebrate with you. Plus save the dates are a chance to have fun and be creative. 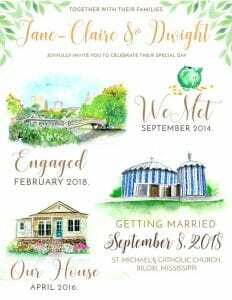 So today I thought it would be fun to share some cute ideas to give you inspiration as you pick out your very own Save the Dates! Having a destination wedding? 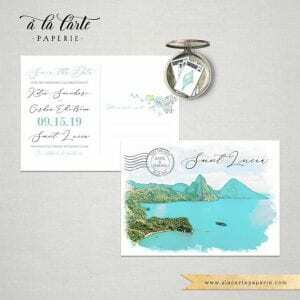 These adorable Save the Date are perfect! A simple map shows your guest the romantic location you have chosen to be hitched! These sweet love story Save the Dates are amazing! Custom made to reflect your love story your guest can relive your milestones before they come to you biggest event! Why not include your fiance’s favorite sports team as the center point for your Save the Date. 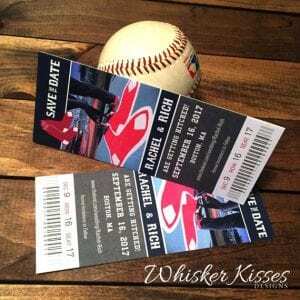 These cute custom made tickets will tell your guests all the details of your big day! Whatever you choose, remember as a rule of thumb you want to send your Save the Dates out at least six months in advance! Want more great tips on planning your wedding. Contact Magnificent Moments Weddings today! We would love to help you make your day memorable!